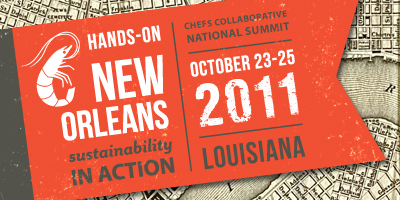 Something happened to me in New Orleans during the Chefs Collaborative National Summit. Problem is I don’t know what it is just yet. What I can tell you is that I fell in love with the city more than any other place I have ever been. Some might say that’s because of the “Bourbon Street Buzz” but although that was fun, its not the reason. The architecture and history remind me of walking through the streets of Logrono, Spain the capital city of Rioja. Every time the wind would change direction you would get a new aroma drifting by that you just want to follow as if you were in a cartoon looking for that apple pie in the window. I can close my eyes right now and smell the distinct aroma of the French Market, the coffee shops and even the smoke filled Jazz bars had a distinct aroma that fit the venue. The sounds of music, all types of music from every type of bar you can imagine filled the streets well into the nights. 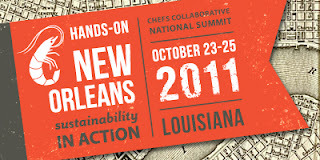 The group of people from all over the country assembled for the 2011 Chefs Collaborative National Summit was amazing. Chefs, restaurateurs, farmers, ranchers, fisherman, conservation and sustainability experts all gathered to learn, share and have fun in a city with so much to offer the rest of the country. What was very humbling to me was the sense of pride that I sensed from every local chef that cooked for us during the 3 day non stop feast of some of the most unique and delicious food I have had in a long time. No foams, sous vide or multi-level presentations, just local chefs cooking the food they love to eat. It was if they each told a story about themselves with every bite of every meal. These chefs all want you to feel the pride they feel when they cook. When they speak they speak from the soul. They make you feel the passion they have for their culture, their food traditions and each other. It was such an emotional experience for me personally to hear every chef, and I mean every chef talk about the other chefs in the city and not themselves. No competition, no egos, just so real that I will forever strive to emulate these amazing people who cook because they just plain love to cook. Another almost surreal experience was being able to walk up to some chefs that I have looked up to for years and just say thank you for their inspiration. Chefs like Michael Leviton and Sam Hayward, Susan Spicer and many more are so humble yet have a presence that will always inspire me when I put my chef jacket on. The Chefs Collaborative team did such an amazing job putting this together, the discussions, demos and networking opportunities were all very informative and I feel much more prepared to work on some of the projects I have been wanting to start but haven’t had the proper knowledge to get the ball rolling. The thing Ill remember most about this trip though…….the company I had with me. A small group of us that just thought alike to the point of being somewhat creepy. We had remarkable conversations about each others kitchens, projects and lives. The interest in every little conversation was too a little daunting but fascinating at the same time. A connection between people who understand each other’s labors in this profession and can work through solutions with each other all while having such a great experience. When you first log onto the Chefs Collaborative web site the first thing you read is… Chefs Collaborative is a national chef network that’s changing the sustainable food landscape using the power of connections, education and responsible buying decisions. but in reality its so much more…By reading and thinking about each of the guiding principles (which you can read by clicking here) Chefs Collaborative is a way of life…a way of doing business…and most importantly its a family of people from around the country who are all working towards the same goals. As I finish this up I guess I do know what happened to me in New Orleans, I became a better cook and a better chef and I hope that you will consider becoming a part of this great organization and share your experiences and best practices to achieve the vision.